Once you understand where you come from, you’ll be able to see where you’re going. I read this quote a few weeks ago – the author attribution was simply ‘Irish saying’. I am planning a trip to Ireland in the fall to revisit where my grandmother was born and raised so it seemed a timely thing to save. 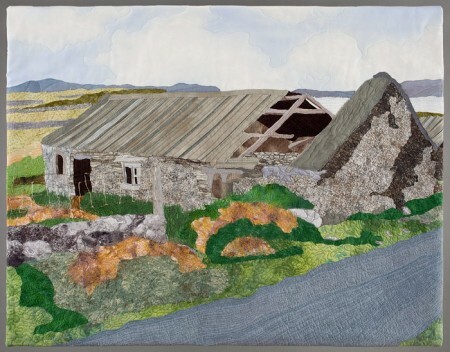 Last year I created a quilt depicting the remnants of a cottage that helped determine my grandmother’s life. It was of a place where her older sister lived after her arranged marriage. The cottage is out on the coast of Western Ireland. The closest town today is still only a few streets along a road, so it is probably an understatement to say that the cottage setting was quite remote. The story as told to me was that my grandmother decided that she wished to have the freedom to choose whom she married and where she lived. It spurred her to reach out to relatives who had immigrated to the U.S. and soon she was making the journey across the Atlantic herself. As she saved her earnings over the next few years, she sent home funds to allow some of her younger sisters to have a similar choice and follow her. That story has inspired me over the years. My grandmother was a wee bit of person physically but her determination was gigantic. We have a saying in aikido, true power is energy flowing towards a vision. I don’t doubt for a moment that my grandmother had a vision of a better life for her children and their children and she sure acted on it. In moments of doubt, I have learned to revisit my own visions and move forward myself, one step at a time. PS Linking to Off the Wall Friday so be sure to check out the other artists. All I can say is WOW! I really love this and the meaning behind it makes it even better. I just have to say it again – WOW! I liked that piece so much when you were constructing it; knowing the story…helps to know you better too. Lovely! Thank you. What a beautiful quilt and what a lovely story that inspired it. Thank you for sharing it. This is my grandfather’s story, too, Judy. He immigrated from Greece at 16, so that his not-yet-born family could have a better life. Your quilt is inspiring. Thank you for your quilting and your writing.